Having lived in small apartments for most of my life I have put together this list of products and organization tips for small kitchens to help you maximize your space and get organized. Most of my life I’ve lived in apartments, this means I have some hot organization tips for small kitchens. There is one major trick that helps you maximize your space and keep your kitchen organized. That is organizing your pots and pans. Not only do these tricks minimize the amount of clanging going on when you already have a headache from a screaming toddler, but they help you to find things faster. There is one thing that you might have to do when organizing your kitchen space. It’s taking a good look at the amount of kitchen stuff you have and deciding if you really need all of it. Before we maximize the space in your cabinets take stock of what you have doubles and triples of. Create a donate box and get rid of some of the extra things you have. When you have a small kitchen, organization is usually the #1 priority to making it work for you. This can be incredibly difficult if you are a cooker or baker. While we all wish we could have our big kitchen, and one day we will, this is probably not that day and you need organization hacks now. In a small kitchen it’s important to first maximize your space by utilizing every piece of space you have. This means utilizing doors, wall space, and under cabinet space as efficiently as possible. Take a good look at your pot and pan cabinet before reading on. Let’s start organizing pots and pans to give you a more organized space for ease when cooking your next meal. Related Post: How To Declutter Your Home Fast. I never fully realized the importance of cabinet organization until I had my kid. For no other reason than if he’s sleeping I tend to not like loud banging of pots and pans searching for a lid. Don’t get me wrong, we make plenty of noise while he sleeps, but crashing pan lids are not one of those noises. 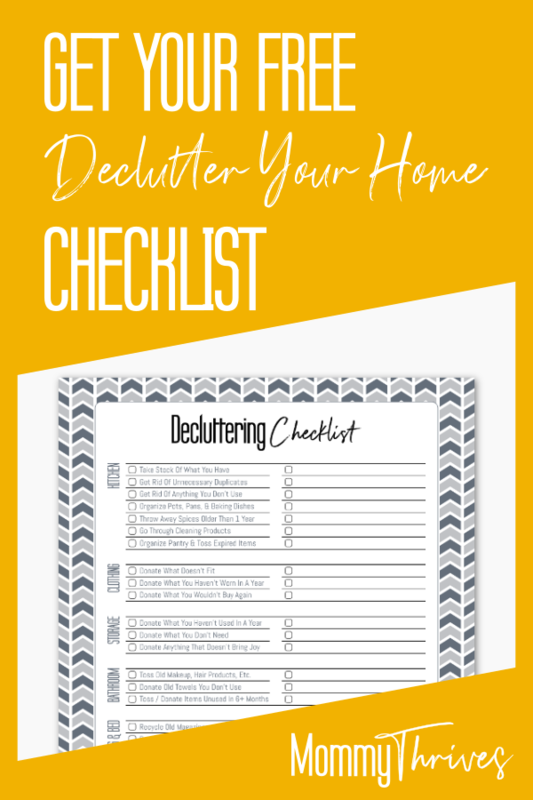 Learn how I clear the clutter in my home in How to Clear the Clutter in Your Home. Organizing that pot and pan cabinet so I could cook while my baby napped was extremely important. Trying not to make crashing noises while a child slept is one of the most nerve racking things any parent will do. Installing lid holders on the sides of the cabinet, or on the doors will give you more space in the bottom of the cabinet for pot and pan placement. Removing the lids completely from the cabinet by installing them on the wall or on the side of a cabinet will open up even more space. Lid holders also make it easy to find the correct lid for the pan you are using without grabbing the next size smaller and accidentally dropping it in the pan of sauce. This has happened to me on more than one occasion. No one wants an extra dish to wash when it wasn’t necessary. Related Post: How To Deep Clean Your Fridge. When picking out a pot rack you will need to figure out where it’s going to go. For small apartment kitchens, hanging a pot rack above the sink saves space. Measuring that area and also measuring ceiling to where the tallest person in your home hits prevents head injuries when cleaning kitchens. I narrowed down some search results on Amazon so you can find a pot rack that works well for your home. I personally recommend the one above as it is adjustable for height. The clean look of it, height adjustment, additional hooks and the price is reasonable. The reviews are good as well and many included pictures so you can see how this might look in your own kitchen. A pot rack is a great way to free up valuable cabinet space for baking dishes or even more places to put food. If a pot rack hanging from the ceiling doesn’t work well for your kitchen you can always try hooks or shelving on an extra wall. If you prefer to not have your pots and pans hanging out, that’s fine too. I have some options that help you keep noise to a minimum while searching for a pan and also maximizing your cabinet space. As previously mentioned you can use lid organizers inside the doors or installed inside the cabinet walls to keep your lids organized. There are also a few ways to organize your pans too. You can use this stand to organize your pans if you you have plenty of height within your cabinet. This means no more fumbling with each pan to get the size you want. If you don’t have tall cabinets no worries. Flip it on it’s back and you can easily organize your pans in a row still keeping noise to a minimum. Installing your lids on the wall and pans in a row or column just freed up the majority of your cabinet space. This may also allow for you to put your cutting boards and cookie sheets in the same cabinet and maximizing your space inside the cabinet. Additionally, keeping cutting boards off your counters helps your kitchen to look cleaner. Using this for your cookie sheets keeps them separated for easy pull out and back but also condenses the amount of space they take while helping to prevent crashing and tipping. This item can be used with the over the cabinet hook, which is great if you are a renter. It can also be installed to the inside of the cabinet for invisibility on the outside of the cabinet. You can use them for more than just cutting boards too. Put your foil, parchment paper, saran wrap, Ziploc bags, and plastic grocery bags in them. Install one on each cabinet door and maximize all of that unused space. Do you have any organization hacks for your pots and pans, please share in the comments. Follow me on Pinterest and pin this to your favorite organization boards and share it with your friends. Subscribe to receive more like this and exclusive content directly in your inbox.